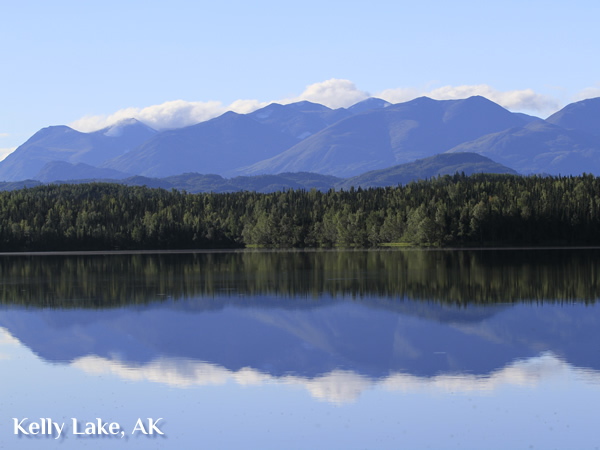 Sterling Highway Campgrounds — Alaska's camping opportunities continue along the Sterling Highway and on the Kenai Peninsula. Sterling Highway, Route. 1 from the junction of the Seward Highway at the Y near Tern Lake See : Alaska Atlas & Gazetteer page 71, B-3, to Homer (page 62 B-1). Leading 142 miles from the Seward Highway to the tip of the Kenai Peninsula, the scenic Sterling Highway has some picturesque views of Cook Inlet on its southern section, along with viewing and access to the Kenai River, the Kenai National Wildlife Refuge, Kachemak Bay, and the towns of Cooper Landing, Soldotna, Ninilchik, and Homer. Crescent Creek Campground — mile 60.5, 9 campsites, camping, picnic area, fire pits, toilets, hiking, gold panning. Limited space for larger motorhomes or trailers. Getting to the campground is easy, turn down Quartz Creek Road next to Sunrise Cafe and Kenai Lake, follow down this well maintained gravel road, past Quartz Creek Campground, staying left at all major intersections for 3 miles to the Crescent Creek bridge. Turn left past the bridge into the Crescent Creek campground. No reservations are taken for the Crescent Creek Campground. There is a $10.00 user fee per night. The maximum stay is 14 days. This secluded campground offers a wilderness feeling and provides opportunities for good hiking and good fishing for Dolly Varden in the creek and Grayling if you decide to hike up to the lake. Fishing in Crescent Creek and Crescent Lake is very popular for nice size grayling. There is also a forest service cabin that is available for rent on Crescent lake. Porcupine Island Campground — located about 6 miles down Kenai Lake from the Boat Launch at Quartz Creek Campground detailed above. This is a primitive camping area with no road access. The photo to the left is of Porcupine Island mid way down the lake. Access is limited to canoe, kayak, powerboat or float equipped aircraft. Excellent tent camping available for two to three sites. There is also a small camping area available in the cove on the main shoreline. The cove is well protected from winds and offers very good anchorage for larger boats. Cooper Creek Campground — located at Milepost 50.7 of the Sterling Highway at the confluence of Cooper Creek and the Kenai River. This is a good size campground with 26 sites, including 3 tent sites. Facilities include water, toilets, tables, fire pits, and dumpster's. Reservations: Can be made through the National Recreation Reservation System by calling toll free, 1-877-444-6777 or by accessing their website for Cooper Creek Campground to reserve a campsite. There is a $10.00 single fee and $15.00 double-fee. The maximum stay is 14 days. Russian River Campground — U.S. Forest Service. From Anchorage, travel south 110 miles to Milepost 53 on the Sterling Highway, located between Cooper Landing and the Russian River Ferry crossing. This is a large campground with 84 sites, paved roads, but no hookups are available. There is a three-day stay limit at the campground. The fee for camping is a $13.00 single fee and a $20.00 double fee per night. The Russian River campground is on the reservation system. For reservations, please call the National Recreation Reservation Service at 1-877-444-6777 or visit the website Russian River Campground to reserve a campsite in advance. This is Bear Country! All food must be stored properly in your vehicle or lockers provided in the campground. Stay Alert and Be Bear Aware! Russian River Ferry Crossing — U.S. Forest Service. Milepost 55. Located between the Russian River Campground and east entrance to Skilak Lake Road. RV camping is now available and a toll booth has been added at the entrance to the site. Boat Launch, Russian River Ferry access, bank fishing access available. Hidden Lake Campground — U. S. Forest Service. Located 3.2 miles down Skilak Lake Road. Paved roads and boat launch. Rainbow trout and lake trout fishing. Jean Lake Campground — mile 60.5 There are 3 campsites available on Jean Lake in this small campground along the Sterling highway. Campsites can not be reserved in advance. These sites are all on a first come, first served basis. Available are fire pits, toilets, boat launch. Excellent rainbow fishing especially in the spring as the ice retreats. Beware as you enter and exit this campground as the entrance road is steep and visibility entering the highway is poor. Limited space for larger motorhomes or trailers. Kelly Lake Campground — mile 68.3 Three campsites, tables, fire pits, toilets, handicap accessible, boat ramp, fishing for rainbow trout, great for canoeing, outboard motors prohibited. Quiet and secluded area approximately 1 mile off the main road. Bird watching areas. Peterson Lake Campground — mile 68.3 camp sites, tables, fire pits, toilets, handicap accessible, boat ramp, fishing for rainbow trout, great for canoeing, outboard motors prohibited. Quiet and secluded area approximately 1 mile off the main road. Bird watching areas. Watson Lake Campground — mile 71.3, 3 rough camp sites, tables, toilet, fire pits, drinking water, boat ramp. fishing for rainbow trout, great for canoeing, outboard motors prohibited. Quiet and secluded area approximately 1/4 mile off the main road. Bird watching areas. Isaac Walton State Campground — mile 81, at the junction of the Moose and Kenai Rivers. 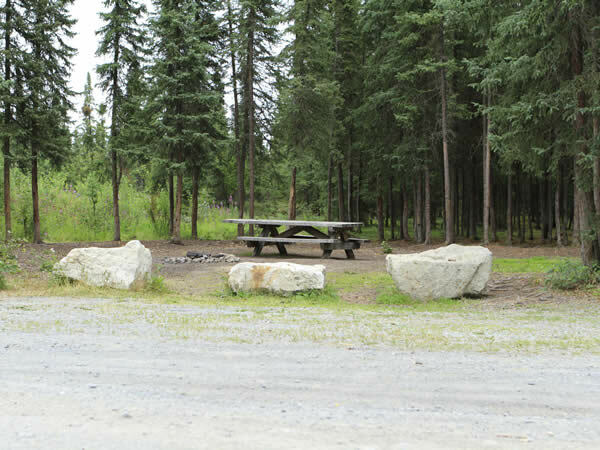 camp sites, tables, fire pits, toilets, handicap accessible, boat ramp, fishing on the Kenai and Moose rivers. Excellent for sockeye salmon in June and July. Fee Area with onsite campground host. Swanson River Road — mile 83.7 south side of the town of Sterling. offers four remote campgrounds and two canoe trail systems: Sunken Island Lake Campground (7 miles), Dolly Varden Lake Campground (15 miles), Rainbow Lake Campground (16 miles), Swanson River Campground (18 miles). Fishing for rainbow trout, great for canoeing. The road is loose gravel and dusty in dry seasons but well maintained and accessible with motorhomes and trailers. Powerboat usage is permitted on refuge lakes as long as the no wake policy is observed. Both Dolly Varden and Rainbow Lakes have some type of boat launching available. Scenic View RV Park — Milepost 127 located on the Sterling Highway near Ninilchik Alaska, 180 miles south of Anchorage, between Soldotna and Homer. This RV park has an unobstructed view of Cook Inlet and Mt. Redoubt volcano as well as the Alaska range known as the ring of fire. Ninilchik River Campground — State of Alaska, Milepost 135.2 of the Sterling Highway. 39 sites with centralized water and bathrooms provided. Beachcomber RV Park and Hotel Milepost 135.5 of the Sterling Highway is located on the beach in Ninilchik. Ninilchik Beach Campground — State of Alaska, Milepost 135.5 of the Sterling Highway. This is a popular beach for razor clamming. During minus tides there is access to the clamming beds adjacent to the campgrounds. Use caution when working these two areas during incoming tides and please guard against over-exertion. There is a day-use parking area and campsites at Ninilchik Beach., Alaska State Recreation Area. Ninilchik View Campsite — State of Alaska, Milepost 135.7 of the Sterling Highway. This campground is located on a bluff above Ninilchik Beach. A stairway leads down the bluff to the beach. A Dump Station is located at Ninilchik View SRA., Alaska State Recreation Area. Stariski Campground — State of Alaska, Milepost 151 of the Sterling Highway. 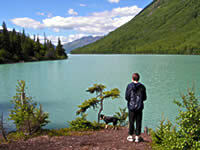 Stariski State Recreation Area offers some of the more scenic campsites along the Sterling Highway. Anchor River Campgrounds — State of Alaska, Milepost 157 of the Sterling Highway. A series of five camping areas located along the banks of the Anchor River. Coho Campground, Steelhead Campground, Silverking Campground, Slidehole Campground and Halibut Campground make up the Anchor River State Campgrounds.